Concrete is a popular construction material because it is durable and easily handled. In some cases, constant exposure to the elements can make the surface of concrete sandy in texture. This problem also occurs if the concrete became wet during initial pouring. 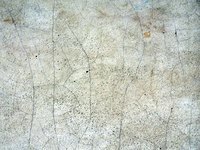 If you have this problem with your concrete, you can easily repair the surface and seal it so that the surface is secure and remains durable. Remove all objects from the concrete surface that you want to repair and sweep the floor of loose particles and any debris. Power-wash the concrete surface to break apart the sandy finish. Set the power washer to a low setting initially and use a fanned tip attachment on the hose. Steadily increase the pressure to remove more of the sandy texture if necessary. Allow the concrete to dry completely before continuing. Pour the acrylic concrete sealer into a paint tray and use a paint roller to apply a single, even coat of the sealer directly onto the concrete surface. Allow the sealer to dry for 24 to 48 hours before allowing contact with the surface.